Numerical modelers construct little parallel realities, simulating natural or engineered systems in a binary alternate universe of patterned electrons. It is more fun than anyone should have at work. Most models include uncertain parameters, numbers that represent some process we don’t understand or data that are too difficult, too expensive, or too variable to collect reliably. Before we use a model built on uncertain parameters to predict the future, we need to demonstrate that the model can reliably explain the past. We call this calibration. During model calibration, we adjust uncertain parameters within reasonable range until the model reproduces some measured historical change. However, most natural system modelers are wary of calibrating to a single time series. “What if that time series isn’t representative?” we ask. If we tune the model to eccentric circumstances, the model will predict poorly. A temporally constrained calibration will compromise our model’s generality. We often build river models right after a flood. So it is tempting to calibrate our models to the flood, since this is the dramatic period of change that dominates everyone’s imagination. However, we have found again and again, that if you calibrate to a short period of rapid change, the model underperforms when predicting the future. So “multiple time series calibration” emerged as standard practice in most fields that apply numerical models to natural systems. 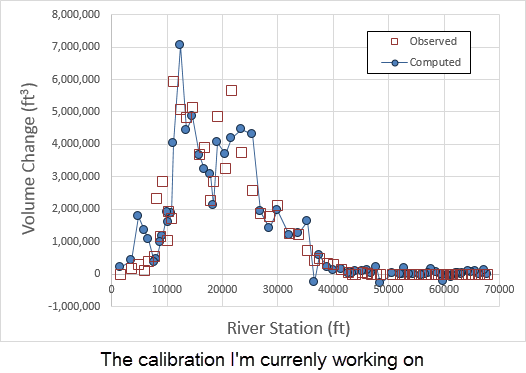 Multiple Time Series Calibration is simply the idea that if you test uncertain model parameters against recent events and historic observations, you are more likely to construct a robust, predictive model, which can handle the full range of possible future conditions. 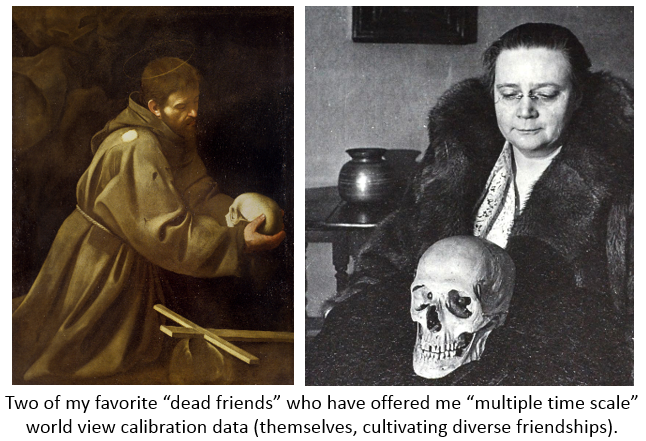 This is why I’ve found cultivating friendships with the insightful dead so valuable. By investing some of my world view formation resources in ancient thinkers, those that pre-date the turbulence of the information age, or even the non-stationatiry of the post-enlightenment milieu, we can submit our world view to multiple time scale calibration. Certainly our conceptual model of reality has to encompass Descartes, Darwin and Derrida as well as more contemporary (and more diverse voices). Our model will not have predictive power if it can’t encompass these observations. But tuning our model exclusively to these recent events (and especially if tuning our model hyper recent foci of, say, Twitter) won’t generate a robust framework. The future is uncertain, and our models of reality are built on uncertain variables that make the parameters that span five orders of magnitude in my field seem adorably concrete. But tuning those parameters to a brief, recent, time series is unlikely to produce a robust model. Real diversity includes temporal diversity, seeking out ancient voices about how to be human, about what matters and why. A model robust enough to explain modern and ancient observations, is flexible enough to handle the uncertain time series ahead of us. This post was written by listening to the Dawes Pandora Station. Disclaimer: I have to build a technical bench with this argument. So I spend over 300 words talking about numerical modeling, before I get to the point of general interest. Hopefully it will be worth it. For those who don’t know, that’s what I do. I build numerical models of rivers and river processes to support ecological and engineering decisions. Multi-parameter models can yield the same answer different ways. They are non-unique solutions. So just because a model reproduces the past, doesn’t mean the parameters are correct, or that it will predict the future reliably. This is the principle of equifinality. We do not talk enough about how equifinality is embedded in the world view formation process…and by not enough, of course, I mean, at all. Evaluating a calibration to a second, independent time series is often called “validation” or “verification” but this language is extremely fraught, and I’ve argued that the whole debate is academic and totally out of touch with practitioner experience. So I have adopted this more general terminology which has arisen independently from multiple corners of the water world which describes the process more precisely and the experience more frankly. More and more, recently, they also have spatial bias, as content providers deliver information targeted to interest, leaving us totally ignorant of huge swaths of calibration data unless we INTNTIONALLY inhabit diverse information ecologies. Wow, that was something of an abrupt transition. But some of my most cherished mentors have been dead for centuries. I wrote a piece on this Caravaggio paining and why Francis is holding a Skull. I assume the Sayers pic is along the same lines, but there is mischief in that smile. (By the way, the Caravaggio double dips on the dead friends, as both the author and the subject count). You are going to have to just trust me that I didn’t try to alliterate there. But I’m also not going to pretend I didn’t find that enormously satisfying. The best argument for excluding historic data in world view formation is that they are too badly biased, selecting for privilege. This is not a trivial argument. But there is an analogy for this in science too. Historic data are usually biased. Preservation is a stochastic and fundamentally biasing process. * But we find historic data so valuable in model formation, so useful in building model robustness, that we’ve developed careful methods to incorporate it. My first reaction to finding historic data isn’t to toss it because its biased, but to do a little dance of joy because I know it will make my model more robust if I handle it well. *I currently have a student pulling 1700 newspapers and another student examining 40 tree cores to provide historic context for the modern measurements I’m dealing with, and also to provide a BS check for my model. But in both cases we talk about “preservation bias thresholds.” There are significant events that we do not capture because they escape the notice of reporters and trees. But the historic record is too important to ignore because it’s biased. We come up with creative ways to correct for the bias, and learn from the data. So yes, history and historical philosophy and historical theology was written by white men who had enough resources to study and write. Historic world view data have “preservation bias thresholds.” And we need to make some correction for that. But ignoring the historic data that could add robustness to our model because of preservation bias is a fallacy that the scientific community rejects in our model building. Because right or wrong, he never did it any other way. Incidentally, even though Lewis and Chesterton are moderns, they kind of count as surrogate ancients, and not just because Lewis self-identified as a dinosaur, but because they themselves submitted their world-views to multi-time scale calibration. Good science fiction requires good science. That seems axiomatic. So I figured my scientific training would expedite my science fiction experiments. Turns out I was right…or at least as right as I could be as I also discovered I was entirely mistaken. I believed making science would prepare me to make fiction, but writing science would hurt me when writing fiction. I’ve found mostly the opposite. It turns out that the words I logged writing science, telling evidential stories about the counter-intuitive processes in our world, prepared me to tell stories about other worlds. But I’ve uncovered cognitive tools, so basic to the scientific enterprise I scarcely notice them humming under the hood, that I had to unlearned before I could write modern fiction. More specifically, I’ve learned three things about the symbiosis and conflict between science and fiction in science fiction. 1. Technical writing makes excellent training for creative writing. I used to think my technical writing and my fiction were both mediocre because they required antagonistic skills. I thought the subverted each other. I thought technical parsimony undermined the florid description that populated good fiction. I believed that the adjectives I piled into my fiction contaminated the linguistic economy of my technical prose, and sparse scientific descriptions, which scorn not only adjectives but even synonyms, built unhelpful habits for fiction. My writing wasn’t mediocre because I dabbled in genres with different conventions. My writing was bad because I couldn’t write. Both conventions reward linguistic economy. Unnecessary adjectives are equally unnecessary whether I’m describing an experiment or a setting. Adverbs generally beg to be verbs or to simply disappear whether I’ve added them - copiously - to technical reports or novels. Extra words clutter text about worlds real or imaginary, and artfully crafted sentences are as welcome in a journal as a novel. Two of the leading contemporary, speculative-short-fiction authors started their careers as technical writers. This is not a fluke. Learning to communicate clearly, make verbs work, maintain subject coherence, construct sentences that brains can parse, and make stories flow, are important whether they they describe this universe or another. Every hour I spent taking the proverbial sawed-off to zombie nouns, selecting precise, slightly onomatopoeic verbs, simplifying sentences, until the technical prose had something of a cadence, was an investment in my fiction. And as I learned the art of right branching sentences, considered the psychology of clause storage, and added other tools in the fiction quiver, my technical writing improved. Science writing doesn’t have to be Hemingway. 2. Science is Generalization but Fiction is Incarnation… and those are, like, really different. So I started writing fiction with a few of my million words already littering rarely accessed tomes in science libraries and obscure academic journals. But my science training did ingrain skills I had to unlearn. One of the most important science making skills stands opposed to one of the most important literature making skills. In fact, you could say, they are opposite skills. Science coalesces particular observations into generalizations. Literature embodies generalizations into particular observations. Science is generalization, moving from details to system, from observation to hypothesis to theory which may or may not prove resilient under a thousand Poparian assaults. Fiction embeds the general in the particular. It incarnates theory and idea into observation, sense, setting, dialogue, and detail. It evokes a common sense, a shared human experience, from a unique, novel, detail. Science moves from detail to paradigm. Science distills data into organizing principle, or at least heuristic. So, when a scientist writes fiction, it stings to leave things at the level of observed detail. I want to interpret. I want to distill detail to paradigm. A novel is like a thesis that only includes methods and results, leaving the synthesis of the discussion to the reader. But there is at least one way science helps the fiction. Both science and fiction are built on formal, rigorous, apprenticeship in careful observation. Science requires careful observation, noticing details that escaped generations of better observers. You cannot do good science without re-examining data, looking at them one more time, for the eighth, ninth, fortieth, or four hundredth time, until you see that one distinctive detail that tells the story anew. I wall paper my office with huge posters of data, and stare at them, and sometimes swear at them, until they tell me a story that I’ve never heard before. If you can apply that skill to social worlds, both contemporary and imagined, the scientific apparatus can help fiction. The author searches reality for moments, gestures, phrases, and reactions that are such startlingly familiar instances of a general human experience that they will even feel familiar in another world. Both science and fiction build out of a careful collection of surprising detail. Fiction just leaves synthesis on the table, letting readers pull the observations together into their own world and conclusions. A problem I recognize I’ve only partially rectified. But you’ve got to write abysmal words you edit into bad words before you can write mediocre words you edit into good ones. And a blog is a good place to practice. Sorry. And in Cheng’s case, continued his day job…at least until he sold Stories of Your life for $25 million. I have so many mixed feelings about that. I am thrilled to see Chang get paid. And I like the team associated with this project. But I also think that the very things that made Stories of Your Life one of the greatest pieces of modern short science fiction, are the things that will make it difficult to convert to film. The similarity of tomes to tombs is surprisingly apt when considering the black binding gestalt of the shelved thesis. Fictions instantiate class. The whole Platonic form thing is passé, replaced by a better metaphor from object oriented software development. I have four pieces of paper on the wall and a recurring pay check telling me that’s what I’m supposed to do. Ok, I don’t have my science diplomas on the wall. I don’t actually know where they are. It’s a metaphor…or, um, an allusion. I’m still bad at this. Also, I’ve never spelled metaphor correctly on the first try. It’s like restaurant and colleagues.